of Lancelot how love had overcome him. Dante Gabriel Rossetti had drawn the lovers reading, possibly by Leigh Hunt's poem The Story of Rimini rather than Dante, as early as 1846. 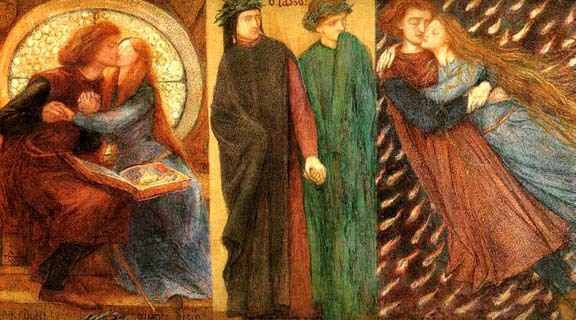 William Michael Rossetti records that a triptych was planned in November 1849 with the same scenes as in the watercolor but differently ordered: In the middle, Paolo and Francesca kissing; on the left, Dante and Virgil in the second circle; on the right, the spirits blowing to and fro. Drawings of the lovers kissing survive which probably date from this time. But it was only in the autumn of 1855 that Rossetti took the subject up again and completed it as this watercolor in one week. He got 35 guineas for it from Ruskin. A finished pencil drawing showing the lovers kissing in front of a halo-shaped window must have been made slightly earlier. Paolo is in red and it can be seen that the picture in the book he is reading, which closes the circle and leads to the fateful kiss, shows Lancelot also dressed in red. A plucked red rose lies at the lovers' feet. Ruskin, who offered the watercolor to his protégé Ellen Heaton, who had herself commissioned an unspecified subject from the artist, was worried that the boldness of the scene might make it not quite a young lady's drawing: The common-pretty-timid-mistletoe bough kind of kiss was not what Dante meant. Rossetti has thoroughly understood the passage throughout.